11 pm. The streets were deserted as I took Arayo for her final nightly constitution. As we headed back inside, I was drawn through the night to view the alters which had been erected outside the homes in the neighborhood. Encircled with colorful strands of lights, the alters shared a common theme - brown paper or fabric supported a variety of plants and climbed in height until they reached a print or figurine of a brown woman, dressed in robes, head bowed. It was December 12, the final day of the celebration of the Virgin of Guadalupe, the patron Saint of Mexico. 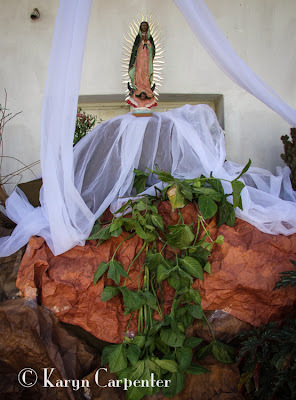 She is the Virgin Mary who appeared to Juan Diego and instructed him to build a church in her honor atop a mountain. It is said she is the reason many Mexican's became Catholic. As Arayo and I walked, we began to hear strains of music and followed the street until we arrived at a festival a few blocks away. At the entrance to the area, a mariachi band played, and beyond them were several blocks of vendors selling food, drinks and gaily lit trinkets that flashed in the night. Arayo and I wandered to the far end, under a fireworks display which was being erected in a much too cramped area, and to a stage where more progressive and louder music was performed. As we don't often hear a true mariachi band, we walked back to the entrance and stood with grandmothers and families to listen a while. Accompanied by violins, guitars and trumpets a short stocky guitar player held center stage, belting out words I could not understand but with a strong tenor voice. I was enchanted. There were 8 musicians in all, though a carefully dressed lad of about 2 wondered amongst them, strumming a toy guitar. He had the makings of a rock star with big brown eyes and the ability to work the crowd. As the musicians began a new number, a man staggered into their midst. Dressed in a filthy button down shirt with GUCCI written across the breast pocket, his pants were several sizes too large and tightly supported by a frayed belt. (Thank God!) The hair sticking out from the NYC ball cap fell in clumps to his shoulders and matched his unshaved unbathed face. He supported himself with a cane and gripped a plastic cup of beer in his other paw. The intro completed to the band's song, this man, who could have been a twin for Charlie Manson, opened his filthy mouth wide, lifted his chin towards the night sky and in nearly perfect pitch stole the position of lead singer. Where had this man learned to sing? Had he professionally trained, then fell into a bottle to be lost to the world of music? Between verses, Charlie leaned on his cane, took deep swigs of beer, then wiggled his hips at the audience. It was a stunning, macabre sight and though no one bothered to toss him into the street, the band was obviously not amused. Song after song, Charlie refused to relinquish his place center stage, and with disgust on their faces, the band packed up their instruments and left. His back-up musicians gone, the beer drained, Charlie wobbled off into the night. Looking back towards the party still in progress down the street, I shook my head, wondered at the things that happen in Mexico, and mentally said my goodbyes to another Saint celebration as we headed home to bed.